The signs claim this 200-acre swath of serenity is in the unremarkable community of Delray Beach. But, in truth, the Morikami Museum does a marvelous job of re-creating a slice of Japan. True, it’s an idealized view: The Morikami (pronounced MOOR-ee-CAH-me) and its adjacent gardens are designed to present Japanese culture as a bridge between two nations. What is here are two distinctly different exhibition buildings and a fine example of the delicate, less-is-more gardening that ushers your average flowerbed into the Gaudy category. The overall effect is to make you feel deliciously alone in the gardens, enlightened in the museums. The history of this unusual place is told by exhibits in the Yamato-Kan, built in the style of a traditional Japanese villa. The history explains the museum/park’s benefactor and moving spirit. The museum’s architecture is inspired by traditional Japanese design. George S. Morikami arrived in Seattle from Japan in 1906, bound for the sandy palmetto barrens a few miles inland from Florida’s Atlantic coast. His way was paid by a speculator who promised Morikami room, board and a $500 payment – after he had labored for three years growing pineapples. The crops were to be shipped north; Morikami was joining the 3-year-old colony of Yamato (YAH-muh-toe), an ancient name for Japan. But blighted crops and cheaper, Cuban-grown pineapples soon forced the farmers to shift to other crops. Having brought over wives and having begun their families, the young workers increased the population of Yamato to about 50 by World War I. However, by the early 1920s, most of the Japanese had left. Young Morikami, however, stayed on, farming and buying land. When World War II began, he was so respected that he was not interned — as tens of thousands of other Japanese-Americans were. The museum displays a letter signed by a federal judge in Miami allowing Morikami to cross county lines in 1942. Following the war, Morikami continued to prosper. He decided he wanted to increase the understanding between his native land and his adopted country. 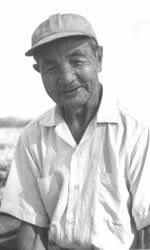 George Morikami, who arrived in America to farm pineapples, persevered, prospered and gave back to his adopted homeland. Although it seems difficult to believe now, Morikami was rebuffed four times in nine years when he tried to donate land to Delray Beach and to Palm Beach County. The reason: The prime farmland was considered too remote from the coast to be of any use. Finally, the county accepted a parcel in 1974, and work was begun on the museum and park soon after. George Morikami died at the age of 90 in 1976, the year before the attraction opened. The original building was the Yamato-Kan. Inside its graceful walls are a series of small rooms that provide historical background on the farming colony – and similar Japanese enclaves elsewhere in turn-of-the-century Florida – and display typical furnishings for a home this size. Old meets new here, with one room holding the traditional bathing tub and another decorated as a modern teenager might do it, with posters of a baseball player and two of the Westernized cartoon teens made popular in Sailor Moon and racier animated films. Outside the Yamato-Kan are a small garden and two stylized bridges. Beyond the bridges are three graceful gardens, sand-and-shell pathways featuring patterns of stones of one color bordered by those of another. Here is a tiny fountain created just for its sound; over there is a large, artificial waterfall. There is also a display of bonsai, the craft of growing stunted trees in small boxes, that includes some native Florida miniatures. The park's grounds and gardens create serenity. A stroll around these grounds removes the visitor from the bustle of the highways that ceaselessly feed Florida’s crowded Gold Coast. The Morikami expanded its offerings, It both displays traveling exhibitions and has other permanent features that offer readable explanations and photos of Japanese culture. Another imaginative room allows an audience to view a traditional room in which the stylized tea ceremony is regularly demonstrated. In addition, the Morikami has a 1-mile nature trail, shaded picnic areas, a restaurnat and an active program of demonstrations as well as major festivals celebrating Japanese tradition. 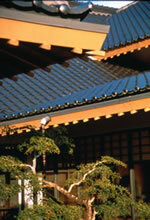 The Morikami Museum and Japanese Gardens are in Delray Beach. The park is just off Jog/Powerline/Carter Road, a north-south street between the Florida Turnpike and I-95. From the turnpike, exit at Atlantic Avenue and head east to Jog/Carter, then turn south. From the interstate, take the Linton Boulevard exit west and head south on the same road. The attraction is open daily except Mondays and on major holidays. Admission is $12 for adults, $11for those 65 andolder, and $7 for those ages 6-17 and for college students. The museum and most landscaped areas are accessible to wheelchair-users, but some paths are not paved. For information, call (561)-495-0233 or go to www.morikami.org.